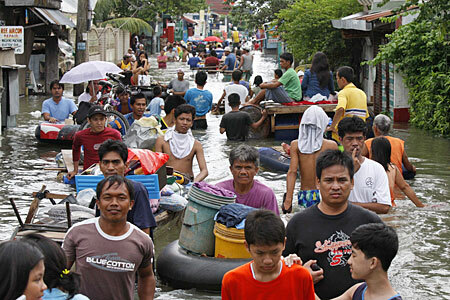 Last Saturday (September 26, 2009) typhoon Ondoy roared across the northern Philippines near Manila, dumping more than a month’s worth of rain in just 12 hours. Nearly 300,000 people were affected by storm, including some 47,000 people who were brought to about 100 schools, churches and other evacuation shelters, officials said. In this time of need, let us all work hand in hand together to help out our brothers and sisters in the Philippines. Friendster has compiled all the verified rescue relief centers across the country, as well as abroad. With a little effort and helping out, we can give aid and assistance to those in need faster. Show you care. Friendster cares. *To donate to the Red Cross Rescue and Relief Operations. Text: RED AMOUNT can be to 2899 (Globe) or 4483 (Smart). *Donate to the Philippine Red Cross rescue and relief via Paypal. *– SMART Money accountholders may help victims of typhoon Ondoy by donating to the PLDT Smart Foundation Inc. (PSF) Ondoy-Smart Money account. Text ONDOY to 270. Or go to your Smart Money menu > purchase > mpay > store code (ONDOY) > pay from > choose card > amount > confirmation (OK) > enter W-Pin. *SMART subscribers may help victims of typhoon Ondoy by donating to the Philippine National Red Cross via text. Text RED to 4483. Example: To donate P100, text RED 100 to 4483. Only donated amount will be deducted from your current load. No other charges applied. DONATION IN THE FORM OF RELIEF GOODS may be turned over at the following SMART Wireless Centers: SM Muntinlupa, SM Bicutan, SM Sucat, Festival Mall, Ali Mall, Gateway, SM Fairview, SM North Annex, ATC South Mall, and Megamall. Selected PLDT business offices (locations to be announced) will also be accepting donated relief goods. 1) SMART Libreng Tawag Centers at the following: Barangay Barangka Hall in Marikina City; Ever Gotesco Mall in Pasig City; and Cainta Municipal Hall. Affected residents may make calls for free and/or charge cellphones for free. Another Libreng Tawag Center to be set up ASAP in San Mateo, Rizal. 2) SMART Relief Goods Distribution Centers will be set up within the week right by the SMART Libreng Tawag Centers at Ever Gotesco Mall in Pasig City and Cainta Municipal Hall. 3) PLDT Medical Services at Barangay Barangka Hall in Marikina City provides emergency medical assistance. Additional medical assistance to be set up by Makati Medical Center and Cardinal Santos Memorial Hospital ASAP beside the other stations SMART Libreng Tawag Centers (Pasig, Cainta, and soon San Mateo). 4) SMART relief distribution will also be done within the week in Marilao, Bulacan and Arayat, Pampanga. send mats for the families to sleep on. City (contact person : Raul Dizon 0917-888-8109).